Leslie Bennington, ME’68, took part in the National Pony Express Association’s 2018 spring 10-day ride, which covered 2,000 miles between St. Joseph, Mo., and Sacramento, Calif. Each year, hundreds of association members re-ride the over-150-year-old Pony Express route on horseback, traveling through eight states. They pass off a mailbag — called a mochila — to each other at each stop. 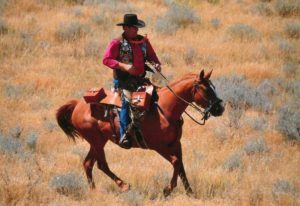 The National Pony Express Association is a non-profit, volunteer-led historical organization that preserves the original Pony Express trail to continue the memory and importance of Pony Express in American history. Bennington has been involved with the association for 38 years, serving as past national president and as of spring 2018, Wyoming state division president.